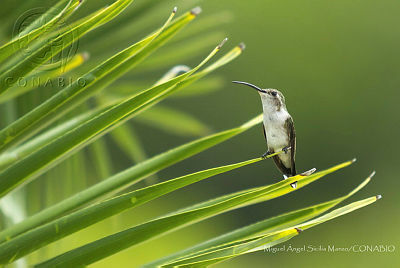 Mexico is a mega diverse country, between 10 and 12% of the world’s species can be found in Mexico. The country depends greatly on the primary sector (agriculture and extensive farming), which is around 3% of the GDP. However, this sector’s activity has provoked the land use changes in at least ¼ of the territory. In a 2016 study, INEGI calculated the cost of environmental degradation and depletion, and it concluded that it was 5 times higher than the total expenditure in environmental protection. Therefore, BIOFIN MX is exploring innovative financial solutions beyond increasing public budget, such as public expenditure alignment, deliver better through efficient expenditure, and avoid future costs due to negative impacts. BIOFIN Mexico is supporting the strengthening of the National Climate Change Fund (FCC in its Spanish acronym) to channel more resources for biodiversity more effectively. The FCC has been identified as one of the most viable financial mechanisms for biodiversity. However, the Fund needs to harmonize procedures with national requirements. 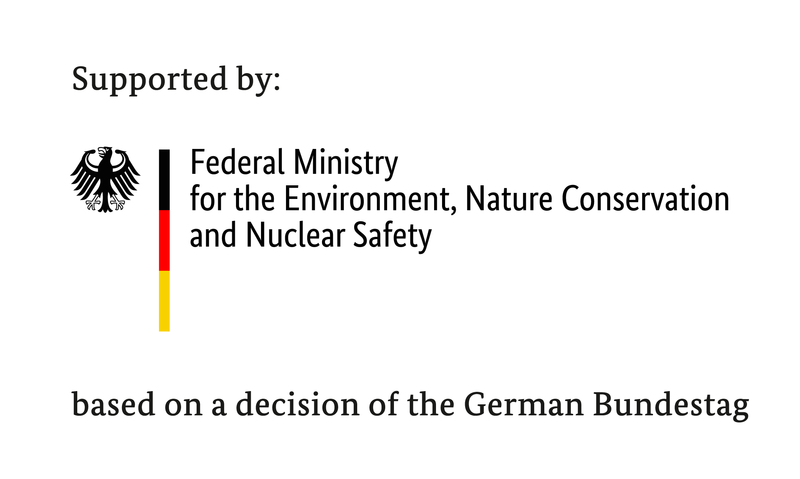 Currently, donors such as KFW and the French Agency for Development (AfD) have interest in channeling biodiversity financial cooperation through the FCC, especially in topics such as: infrastructure in existing Natural Protected Areas; financing for new Natural Protected Areas; Landscape approach and connectivity. BIOFIN Mexico sees a great potential in impact investment for the sustainable use of biodiversity. This tool is being considered as a window of opportunity for the inclusion of private sector. Private initiative has shown interest to invest in biodiversity projects, however there are no clear mechanisms or project portfolios to channel their resources. In this sense, BIOFIN is seeking to develop project portfolios regarding conservation and sustainable use on or near Protected Natural Areas, so they are investable ready for companies. BIOFIN Mexico held a capacity building workshop on local PES schemes for the 9 Regional Directions of CONANP to increase other sources of funding from the private sector and local governments. One of the objectives of this workshop was to strengthen the interinstitutional coordination between CONANP and CONAFOR. Additionally, BIOFIN MX sought to identify gaps in the PES schemes, as well as ways to diversify the recipients, since 49% of PES goes directly to Natural Protected Areas. For example, concurrent funds have the potential to be a mechanism that attracts private investment. During this workshop, CONANP and CONAFOR recognized BIOFIN Mexico as a neutral actor whom enables intersectoral dialogue as well as with other key stakeholders within the private sector. The costs for degradation are significantly higher than to simply conserve ecosystems. In this sense, BIOFIN MX helped -through public policies’ analyses, launched strategies for biodiversity mainstreaming in four priority sectors: forestry, fishing, tourism, and agriculture. These strategies are meant to integrate biodiversity into the plans, projects and actions of the sectors. BIOFIN MX pushed the Mexican Government to prioritize these strategies, thus, they were presented at the COP 13 event in December 2016. Biodiversity public policy and institutions face several challenges in Mexico. Despite there are many institutions which have biodiversity conservation and sustainable use attributions, there is still some work to do towards a better coordination among them. Currently, there are coordination mechanisms such as CONABIO, CIMARES (National Commission for Oceans), and CIBIOGEM (National Commission for Biosecurity) however their level of consolidation should be strengthened. Effective coordination mechanisms with better institutional embedding could enable the biodiversity sector to collaborate efficiently and promote mainstreaming biodiversity policies within other sectors. The national regulatory framework needs to be carefully revised in order to harmonize the wide range of conservation and sustainable use definitions within the different laws. Additionally, national planning processes need to be pushed towards continuity since public policies and instruments are subject to changes from one year to another. Hence, changes in the incentives of public programs that affect biodiversity become difficult to trace. Finally, the mainstreaming agenda in Mexico has become a crucial opportunity for strategic sectors to internalize the costs of biodiversity loss. 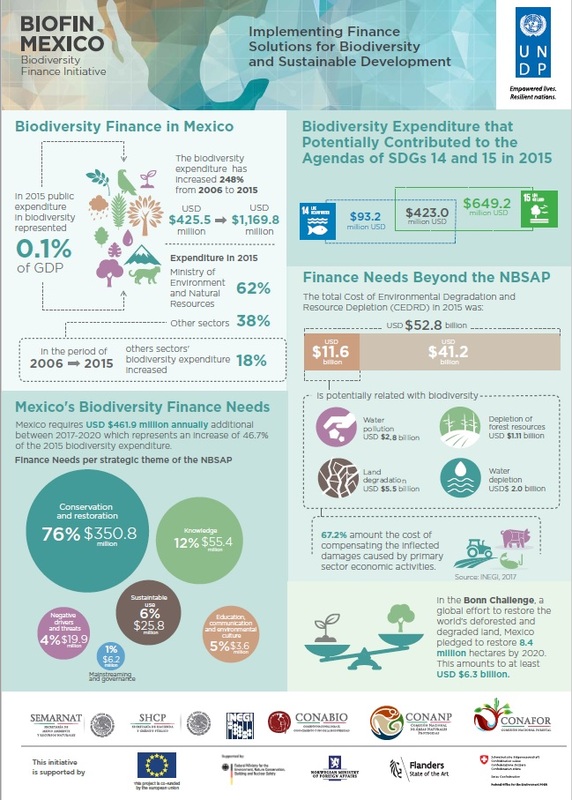 Biodiversity expenditure for 2015 in Mexico amounted $18.6 billion pesos which represented 0.38% of public and 0.1% of the GDP. Despite the positive historical trend, pressures to public finances due to the external and the internal reasons has led to a decrease in the government budget, particularly in the total budget of the Ministry of Environment and consequently to biodiversity public programs. Taking this into account it is key to focus on financing solutions other than the increase in the public budget such as efficiency, public expenditure alignment, and avoiding future costs due to negative impacts. Additionally, the National Evaluation Council (CONEVAL) is an autonomous public institution in charge of measuring poverty and evaluating government social programs. Despite that CONEVAL’s evaluations include biodiversity programs they rarely consider environmental impact and only focusses on the social indicators of the programs. In this sense, some of the challenges include increasing efficiency in biodiversity expenditure; monitoring and evaluating the environmental impact of public programs; as well as the impact of constant pressures to public finances. Furthermore, it is important to strengthen national financial mechanisms to channel international cooperation in a timely, efficient and effective manner. Mexico must also continue to increase its efforts in public expenditure alignment for biodiversity through landscape management approaches through pilot projects and international cooperation. The estimation of finance needs for biodiversity is around USD 461.9 million per year during the period 2017-2020, which represents an increase of 46.7% to biodiversity spending, based on the one exercised during 2015. The finance needs assessment includes: 1) Protected Natural Areas financial gap calculated in 60 million per year estimated by CONANP; 2) The needs of financing to cover the Payment for Environmental Services (PES) demand estimated at USD 202.1 million by CONAFOR; 3) The National Biodiversity Strategy and the Action Plan (NBSAP- ENBIOMEX) finance needs estimated at USD 191.4 million. Another result of the finance needs assessment was that 76% of the required resources are current expenditure and 24% are investment spending. BIOFIN's FNA has helped to establish a path of implementation for the ENBIOMEX and has shown the required resources for its implementation up to 2020. Scoping interviews have been conducted with government officials and environmental financial experts. Consultant’s meetings and workshops have taken place to integrate the results of previous BIOFIN’s components with the Finance Plan. Some of the elements for the Biodiversity Financial Plan include the previous analysis of the current status which consist of the main drivers of biodiversity-harmful impacts; the biodiversity financing gap and programs that encourage biodiversity’s loss; the mapping of current sources of funding for the protection of biodiversity and the financing priorities; and financial guidelines for private and development banks to integrate environmental and biodiversity considerations in their investment portfolios. The private sector involvement is another key factor for the financial sustainability of biodiversity, therefore it is a fundamental part of the BFP. Another relevant point is the prioritization of biodiversity in the national budget planning, which is directly linked with the efficient use of public resources. In addition, the integration of public and private banks is a fundamental part for the channeling of resources. The Plan will also focus in the strategic on key financial instruments and their enabling conditions to increase funding on biodiversity conservation. Additionally, synergies and alignments through other schemes and mechanisms are being explored in order to identify potential resources that can be eventually channeled to biodiversity conservation or sustainable use. Moreover, BIOFIN MX is playing a significant role in facilitating a dialogue on the alignment of sources, agents and instruments to improve access to project financing. Finally, BIOFIN MX is currently working in developing concrete proposals for resource mobilization while identifying: a) Source of resources b) Mechanism for channeling resources c) Instruments d) Expected financial result e) and institutional arrangements. Mainstreaming of biodiversity in productive sectors, such as agriculture, tourism, fisheries and forestry. However, this finance solution also includes the Green budget based on results aligned to Sustainable Development Goals (SDG), to improve the result based planning through modification of the design, rules of operation and indicator matrix of budgetary programmes related to biodiversity and align them to the SDG. Climate and biodiversity finance. This includes the strenghtening of the Climate Change Fund, as a tool to leverage resources from national, international, public and private sources. Another mechanism is to fund projects of environmental infrastructure and/or ecosystem-based adaptation issues through the Environmental Programme of the National System of Public Investment (SNIP for its spanish acronym), whose purpose is financing conservation, biodiversity, restoration and pollution remediation projects. Finance mechanisms for conservation, which are mainly to increase the local mechanisms for the payment of environmental services programme of the Forestry Commission, and to develop conservation local mechanisms in Protected Areas. Impact investment and sustainable businesses, to generate a profitable portfolio of sustainable use projects that can be multiplied and scalable, so that resources from private sector could be channeled to biodiversity. Greening the bank. This solution includes mechanisms such as facilitating the implementation of an Environmental and Social Risk Management System (SARAS for its spanish acronym) in the financial sector, through guidelines and clear indicators. The emission of green bonds is another mechanism to anchor a portfolio of productive projects of restoration or green infrastructure for biodiversity and ecosystems. These groups of finance solutions are not exhaustive and can be complemented with with support solutions such as a coherent international finance vision and economic and finance evaluations. Mexico's exhibition "Echoes of the Earth: Economy and Ecosystems"